Bellamy Central has had the pleasure of organising this London event on behalf of their clients, Topaz Club. The Symposium, Entrepreneur: Exploring Tools for Success, is taking place on Saturday, 26th May 2018, at Chiswick Town Hall. This almost sold out one day corporate event is sure to be an enjoyable and fact finding opportunity for potential and professional entrepreneurs. Guests will have the opportunity to hear, be inspired by, and get involved in key discussions with notable speakers and sponsors which will assist them in their journey of entrepreneurship. This groundbreaking event will be an exciting opportunity to share valuable knowledge and experiences with investors or up and coming professional. There are opportunities for networking during the breakfast and lunch breaks, to socialize with fellow colleagues, sponsors and speakers. 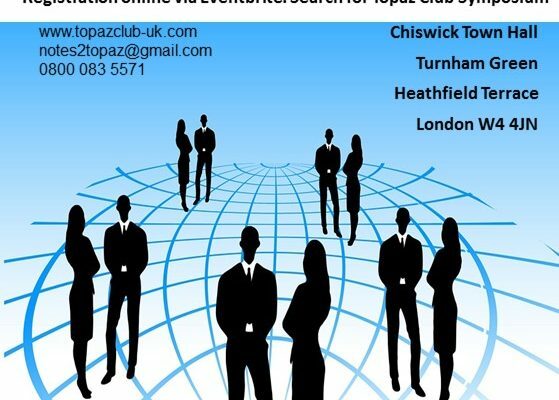 The Topaz Club is a UK registered charity that promotes friendship and support to its members through a series of events, functions and networking opportunities. The Club has a strong philanthropic tradition of raising funds for charitable purposes within the broader community. For more information on this event, please contact info@bellamycentral.co.uk or call 0800 083 5571.